Halloween is around the corner and excitement is in the air! Choosing a good Halloween costume can be a challenging especially if you want to look unique. You can look distinct even in the common outfits if you use your outfit and makeup creatively. 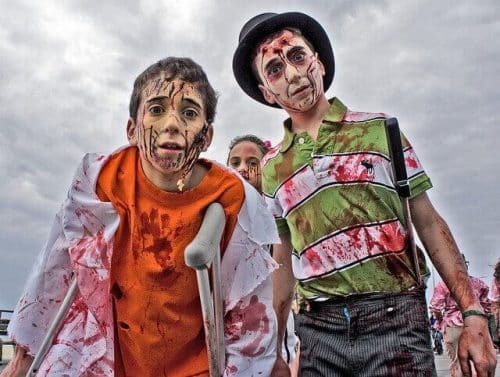 One great idea is transforming into the walking dead this Halloween. Here are some of the tools which you’ll need to gather up before getting ready for this look. Follow the under mentioned steps and you will be able to look like a real Zombie or living dead. You can pick some baggy clothes for this project. Don’t go for the latest clothing items because they will not give you a realistic look. Moreover, they will get stained and ruined. Girls can pick an old and baggy night gown whereas boys can go for bigger size tees and jeans. If you want a more intense look then you can pick a dramatic Halloween costume. You can pick a ghost face boy zombie costume or a bonehead costume that will be perfect to bring the look together. You can now wash your face and wear your white out Halloween contact lenses. If you don’t have white contacts, you can buy them easily online. You can pick a pair of lenses having a jet black background or lenses with white background. White Out Sclera contacts with black background will definitely look more dramatic. You can use these lenses for Halloween celebrations, theatrical performances and costume parties. They have 38 percent water content which provides refreshing moisture to your eyes. Firstly, apply a coat of foundation on your face, neck and arms. Now put some baby powder on this coat. The talc and foundation will give you a dull and pale look. Once you have done this, you can apply black, red or brown eye shadow around your eyes. The foundation will help your eye shadow and talc to stay on your skin for a long time. Afterwards, you can make blood stains on your face and clothes with pancake syrup or red food color.